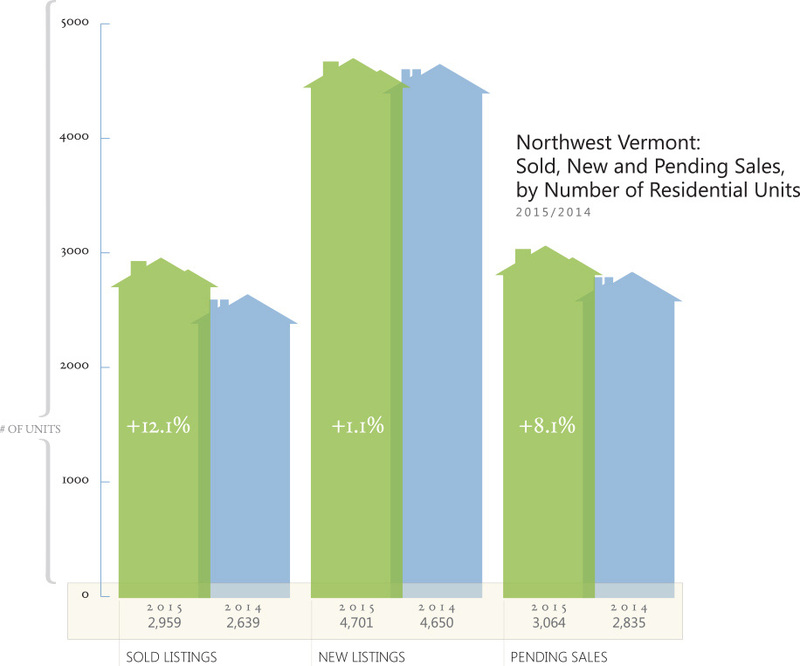 Northwest Vermont’s real estate market is enjoying a period of healthy gains in pricing and demand. The local economy continues to be healthy, lifted by hiring at employers including Dealer.com and University of Vermont, while industries such as healthcare, technology, and education remain vibrant. Dozens of technology start-ups are hiring and attracting mid-career professionals from out of state, as well as hiring graduates from local colleges such as Champlain College and UVM. The unemployment rate in Vermont stood at 3.7 percent in November, one of the lowest in the country. Our region’s jobless rate was even lower, with Chittenden County’s unemployment rate reaching a 15-year low of 2.5 percent during the same month. Millennials are entering the property market, with that generation on track to become the country’s largest home-buying demographic within the next few years, according to real-estate data service Zillow. In Vermont, younger consumers are emerging as first-time buyers, thanks to record low interest rates and relatively high rents, which makes home-buying a more attractive alternative. A Coldwell Banker Hickok & Boardman Realty survey last year found 37% of our clients had just purchased their first home, close to historic rates of 40% for first time buyers. While the Federal Reserve increased short-term interest rates in December, the central bank has signaled that future rate hikes will be incremental. Mortgage rates may reach between 4.7% to 5% by year-end, compared with below 4% currently, according to the National Association of Realtors. Mortgage rates remain historically low, and our Realtors haven’t noted any impact on housing demand from the Fed’s move. Housing in the $250,000 to $350,000 range remains the sweet spot in our market, especially given the emergence of first-time millennial homebuyers. Property in the over-$500,000 range, however, can take longer to sell, and inventory in the upper ranges has been growing because of affordability issues. The luxury segment, or properties priced above $800,000, now has a three-year supply of inventory. While the overall property market remains stable, there are a few issues that bear noting, including rising concern over affordability and property taxes. Vermont’s housing ranks among the most expensive in the country, but incomes in the state remain relatively low, creating a financial crunch for some buyers and property owners. Vermont also has one of the highest property tax burdens in the country, according to the Tax Foundation. Legislators are taking action intended to support quality outcomes for students and make costs more sustainable. Homebuyers and property owners are advised to keep an eye on Act 46, the education governance reform law passed last year that calls for larger school districts. That could impact some towns in our region, such as Essex, Essex Junction and Westford, which late last year voted to consolidate into one school district. It is important for homebuyers to reach out to school administrators in the town they are considering with any questions. We find public and private schools have always welcomed conversations with perspective families considering a move to the area. The National Association of Realtors forecasts a median price increase of 4% to 5% and existing home sales rising 1% to 2% in 2016. Locally, Coldwell Banker Hickok & Boardman Realty is forecasting continued steady growth in pricing and sales for 2016, after last year’s 12% gain in residential transactions and 3.4% boost to the region’s median sale price. As for sellers preparing their home for sale, Coldwell Banker Hickok & Boardman Realty recommends taking care of deferred maintenance issues prior to listing. Also, consider installing new “smart home” technology. These devices are relatively affordable, and consumers are increasingly embracing the technology, according to a joint survey from Coldwell Banker and technology site CNET. On top of that, smart devices such as Nest’s thermostat can help save money by conserving power and water, which will make your home even more appealing to buyers. Luxury properties in Northwest Vermont span a variety of styles and locations, from classic Vermont farmhouses on mountain estates to award-winning modern properties perched on Lake Champlain. Sales of properties above $800,000 picked up in 2015, with our Realtors noting that 2015’s luxury home sales represented an increase of more than 25 percent from a year earlier. Additional sales in 2015 may fuel future activity by providing market comparables that help support purchaser’s decision making and provide appraisers with current market sales. Even with the increased activity, the luxury segment still remains a buyer’s market, given that our region has a three-year inventory of homes listed for more than $800,000. In Coldwell Banker Hickok & Boardman Realty’s experience, high-end homes can potentially require years to find a buyer, and many sellers have had to lower their price expectations. In some cases, luxury homes have sold below their assessed value. While that isn’t heartening for sellers, it represents an opportunity for buyers, given the wide range of choices currently on the market and the potential to negotiate a lower price. Given the three-year inventory, some prospective buyers are increasingly cautious about purchasing homes in the above-$800,000 range, given that it may take them years to sell if they later decide to move. Senior executives who are more mobile are finding this to be a concern. Buyers are increasingly looking for high-end homes that are close to Burlington and its amenities such as restaurants and the Flynn Center for the Performing Arts. Estates with mountain views and large acreage have also proved popular. Given the choices available to luxury buyers, buyers are seeking properties with no deferred maintenance issues. Homes that show well – such as those that have been repainted recently, have no clutter, and excellent landscaping – are also performing better with buyers. • Thirteen, or about 38%, of last year’s $800,00-plus home sales provided waterfront access. 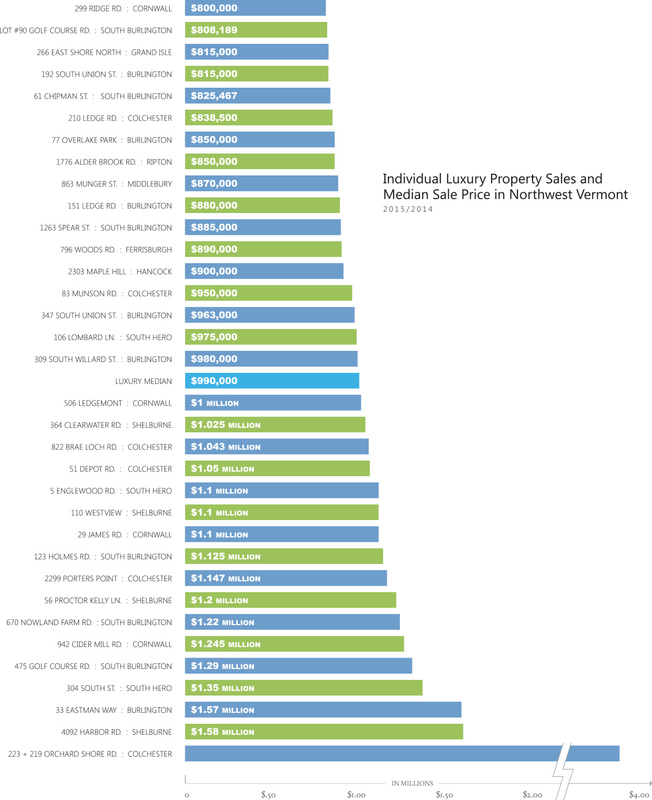 • Almost two-thirds of the year’s luxury sales were located in Chittenden County. Beautiful Franklin County home for sale. Franklin County’s real estate market benefited from an uptick in demand, fueled by homebuyers seeking homes in the sub-$200,000 price range. Lower prices at the gas pump have helped make the county a more affordable option for professionals who commute into Chittenden County or other locations. Nevertheless, our Realtors have noted that the property market is a “tale of two counties.” Towns in the western section of the county are generally seeing stronger demand, thanks to their proximity to the interstate. Pricing and demand has tended to be weaker for towns located in the more remote eastern part of the county. As noted above, towns closer to I-89 have witnessed stronger pricing trends and demand, such as Fairfax, where the median sale price rose 7.5% in 2015. Some towns to the east, which are farther from the interstate, saw a dip in median pricing. Franklin County’s median sale price is the lowest in Northwest Vermont, which makes it an affordable option for professionals seeking single-family homes in the sub-$250,000 range. Properties also often offer more land and space than in neighboring Chittenden County, which appeals to some buyers. Businesses such as pharmaceutical company Mylan and logistics company A.N. Deringer are hiring, bringing new professionals into Franklin County. Thirty-one land sales were recorded last year, slightly less than 2014’s 34 land transactions. While demand was slow during the start of the year, when abnormally cold temperatures kept buyers out of the market, land sales picked up in the summer and fall. The median sale price for land parcels rose 36% to $70,000. The multi-family market dropped slightly, with 18 sales last year, compared with 25 a year earlier. Still, the median sale price jumped 33%, reaching $214,300. 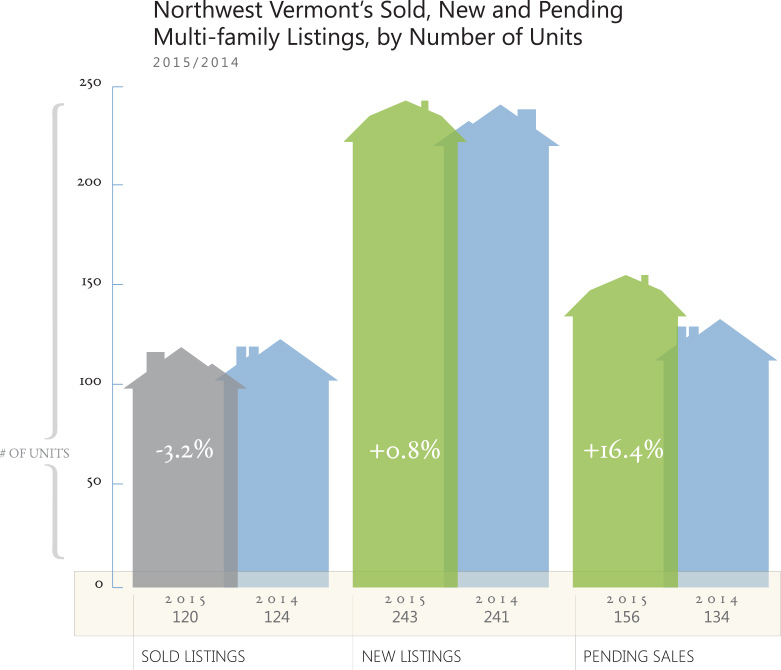 Northwestern Vermont’s multi-family market remains competitive, given tight inventory levels and continuing interest from Vermont-based and out-of-state investors. 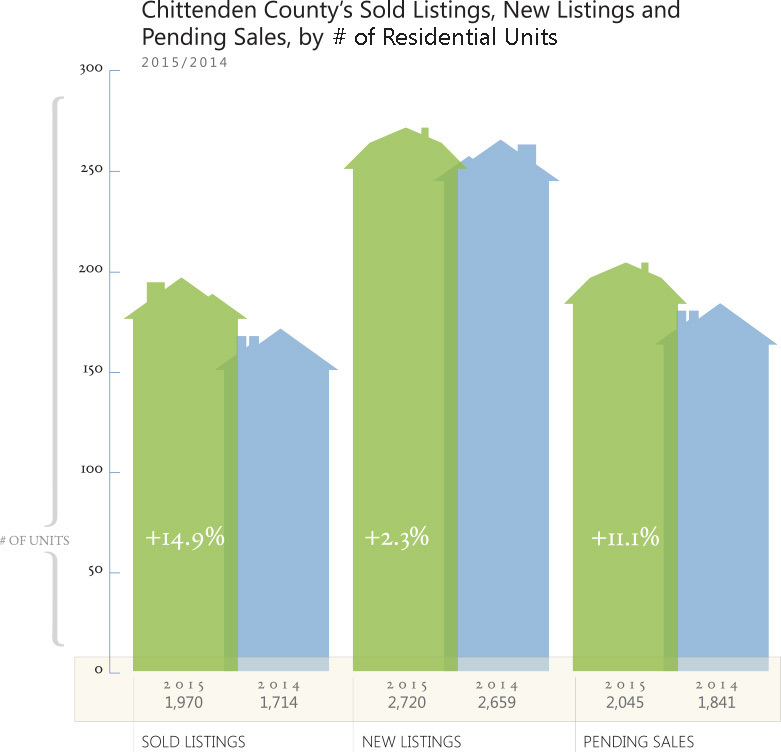 While in four counties combined, the median sale price slipped 2.8% and transaction volume declined 3.2%, Chittenden County had a 6.5% increase in the number of multi-family properties sold. While the number of sales and the median sales price were slightly lower in 2015, that was largely due to a tough comparison with 2014, when two large multi-family portfolios went on the market and several very expensive properties were sold. A continuing issue for the multi-family market is a lack of available inventory, especially in Burlington, the most active market for investment properties. Our Realtors note that properties that are in good condition and in prime locations continue to sell quickly. About 3,500 new apartments are either pending or have been built recently in Chittenden County, which may bring the vacancy rate higher and continue to stabilize rents, according to Allen & Brooks. There will likely be continued growth in the renter market, however. Median household incomes in the Burlington area are about 7 percent below their 2008 peak, and many younger professionals are dealing with high amounts of student debt. That may crimp their ability to purchase homes and lead to more demand for rental housing, Allen & Brooks notes. The rental market’s vacancy rate has seen some easing in recent months due to new apartment building construction. It now stands at about 3 percent in Chittenden County, or almost double the rate from a year earlier. Our Realtors have noted that while investors are keeping an eye on the trend, it hasn’t impacted pricing for multi-family properties. .
Investors are increasingly searching for multi-family properties in this town thanks to demand from professionals who are drawn to its revived downtown area and lower costs than neighboring Burlington. 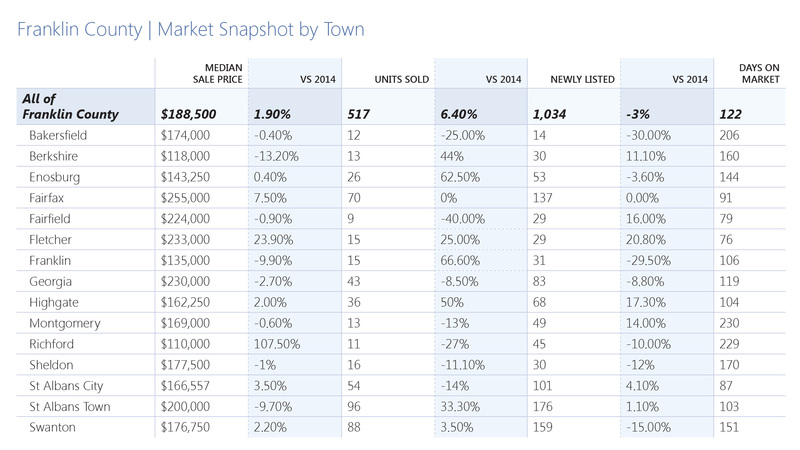 Multi-family sales in Winooski rose 28% last year. With vacancy rates still relatively tight, rents continue to rise across Chittenden County. Across all apartment sizes, rents rose 2.9% in 2015, according to real-estate consulting firm Allen & Brooks. Still, given that recently constructed apartment buildings are offering more choice to the region’s renters, our agents have seen some recent stabilization in rents. Because of those trends, property sales last year were focused on mid-priced homes. The median sale price slipped 14.5 percent to $200,000, reflecting that trend. The number of residential sales, however, rose 18.9 percent during the year. The market is increasingly focused on mid-priced single-family homes. South Hero and parts of Grand Isle town have been attractive to buyers who work in Chittenden County, given the short commute time and proximity to I-89. While Grand Isle is known for its high-end waterfront property, the county only recorded four sales above $800,000 last year. By comparison, Addison County recorded eight, and neighboring Chittenden County recorded 22 sales. impact on median sale prices or volume. Twelve land sales were recorded in 2015, slightly down from 17 in 2014. 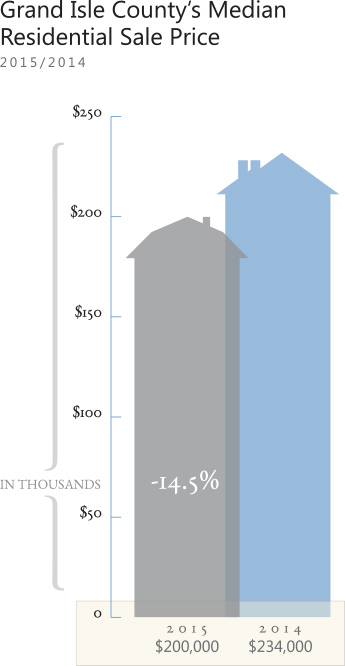 The median sale price declined 58% to $54,375. Chittenden County, the most active real estate market in our region, recorded significantly more residential sales in 2015, thanks to stronger local and national economies and record low interest rates. 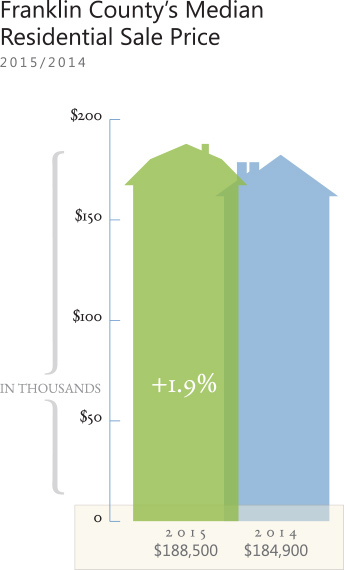 Median sale prices rose 3.1 percent, representing a healthy and sustainable increase. Above-average temperatures during the fall helped maintain some buyers’ interest in pursuing their home searches, capping off what had been a strong spring and summer. Typically, colder weather can lead to some home buyers curtailing their searches until spring returns. Burlington continues to draw homebuyers, including first-time buyers and those looking to move into bigger properties or downsize. The city’s residential sales surged by 22.5% last year, making it one of the county’s most active towns. Still, the median sale price slipped by 2.2%, reflecting demand for lower-priced inventory in the New North End and Old North End. Our Realtors also note that some Burlington sales represented older homes with deferred maintenance, which provided buyers with greater bargaining power and opportunity to build equity. Affordable homes in the $250,000 to $350,000 price range are in the sweet spot, given the emergence of first-time homebuyers who are seeking mid-priced properties as their entry into the property market. Even though the median household income in Chittenden County is about $64,000, or 18% higher than Vermont’s median income, that’s not enough to support the purchase of some higher-end homes. As a result, inventory in the over $500,000 is growing, providing more choices for executive-level buyers. Chittenden County not only has big employers like Dealer.com, but a growing number of tech start-ups that are seeking to hire new employees in both entry-level and mid-career roles. Additionally, the UVM Medical Center and educational institutions such as Champlain College continue to hire, bringing new professionals and homebuyers into the market.. While Burlington remains a popular property market, some buyers are seeking nearby towns that offer more space or lower prices. 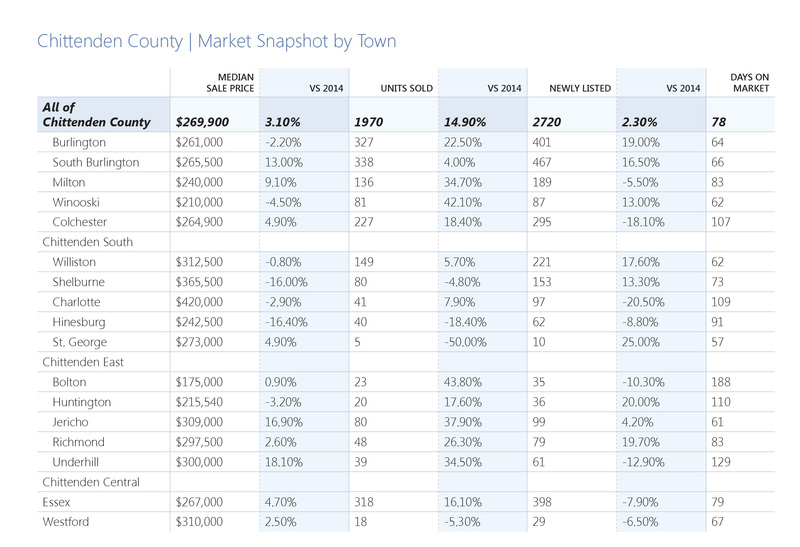 Milton, Winooski, Jericho, and Colchester are among the towns that recorded double-digit percentage increases in sales last year. The multi-family market recorded 98 sales last year, an increase of 6.5% compared with 2014. For a longer discussion of trends in this market, please see our multi-family section in the Mid-Year Market Report. Fifty-two land parcels were sold in Chittenden County last year, little changed from 2014. The median sale price rose 6.8% to $133,500. 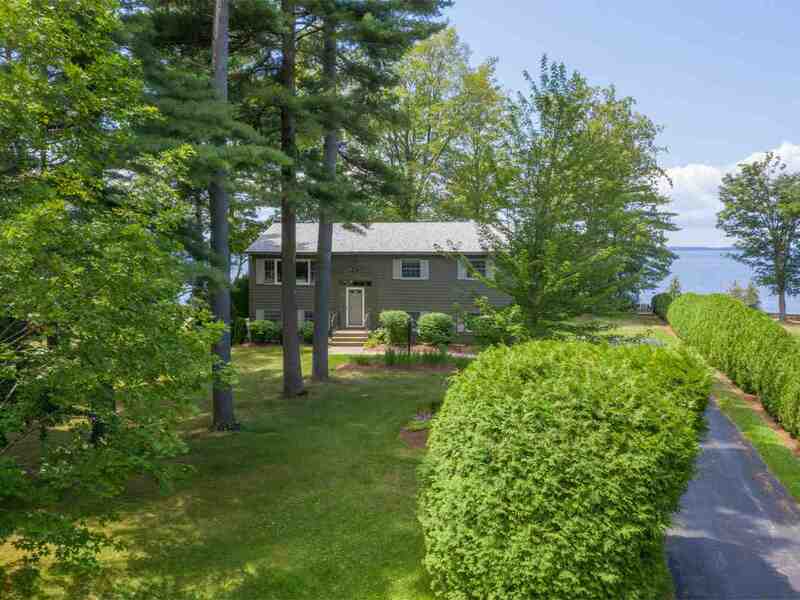 Demand remains steady for lots where professionals and retirees can build custom-homes..
Immaculate Lake Front Home: Westerly sunset views & perfect shale beach on 100' of lakefront. Set far off the road.